You'll fall in love with this nine hour covert watch audio recorder! Investigative evidence recorder you wear! This is a very high quality fully functional watch with built-in digital recorder/player. 256Mb flash memory records 9 full hours of voice via built-in microphone and/or dozens of MP3 music files. Recording results is a cut above last year's model because the sampling rate is greater and he new generation mic built into the watch is much more powerful. You can record any sounds within 30 feet! Highly functional for investigators, law enforcement, journalists, attorneys, and business professionals who must conduct interviews. Great for students and those who wish to record speeches and presentations. Ideal for recording notes on the go, dictation, or reminders. Listen to MP3 music files with included stereo earphones or on your computer using windows media player. Internal rechargeable battery records for 9 hours between charges. USB interface cable included for quick connection to your computer. You will be in a position to record all of your investigative interviews and be proud to wear this expensive--looking watch with it's black face. Only YOU know it has a built- in audio recorder. 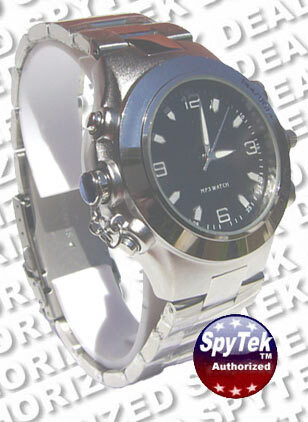 But that's not all this SpyTeK approved new generation high grade designer quality watch will do! Of course, it keeps excellent time and you will love wearing it as a fashion statement. However, besides using it as a nine hour covertly digital audio recorder, you an also use it too download files from any computer with a USB port. That's right, you can take your digital files with you! Aside from that, you can use PI Black WatchTeK as an MP3 player and download music, and pod casts. Just plug the included earphone into the unit and your watch acts just like an MP3 music player. To recharge the built-in battery, just plug Pi Black into any USB port on a computer or the AC adapter. It's time to go high tech and wear the new generation high grade PI Black WatchTeK the federal law enforcement and investigative community is talking about! You will love the high grade crystal clear recording results you obtain and be very proud to wear this on. Get yours today before the price goes back up. We know you'll use it and love it! 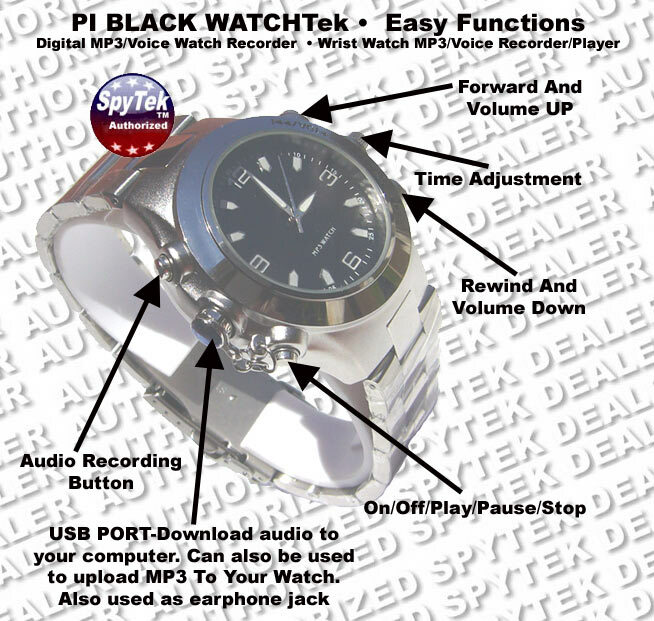 Please Note: PI BLACK WATCHTeK is a trademark claimed by SpyTek. WARNING! Photos- Copyright, Ralph Thomas, 2007.